A year ago last May when returning from a fly fishing adventure in Ontario, I decided to cut across to Detroit Lakes from Park Rapids on Highway 34 rather than continue along the windy Highway 71. Apparently cutting over offered a shorter route on the way home. About halfway to Detroit Lakes, on a native grass meadow, a sea of red graced the green, a color that seemed to simply explode in beauty. For whatever reason my rush to return home gave me adequate reason not to stop and investigate. This year, returning from a similar week-long fishing trip to Ontario, I passed the meadow again. Once again the red danced above the greenness of the grasses, and once again I drove on by. Then, further down the road, the same flowers graced a roadside shoulder, accompanied with a contrasting white prairie flower. This time I stopped. Roadside shoulders are public. 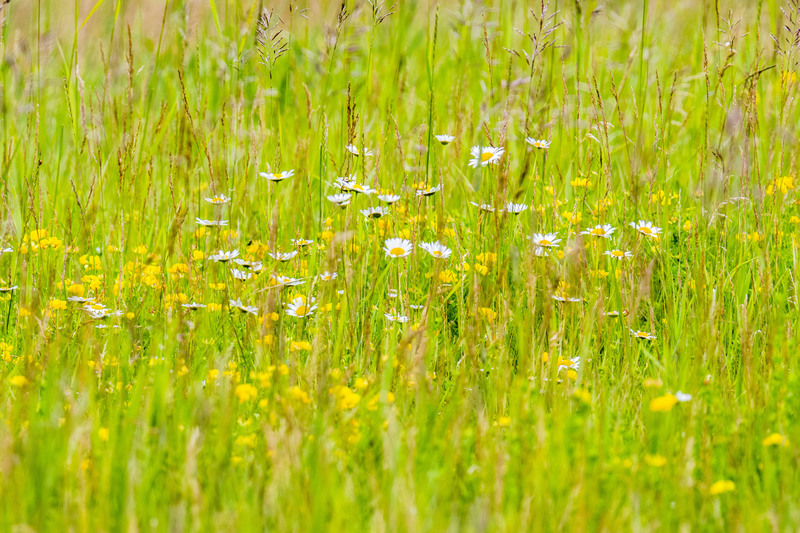 Meadows are not. The red? Indian Paintbrush in all its startling flush of redness. 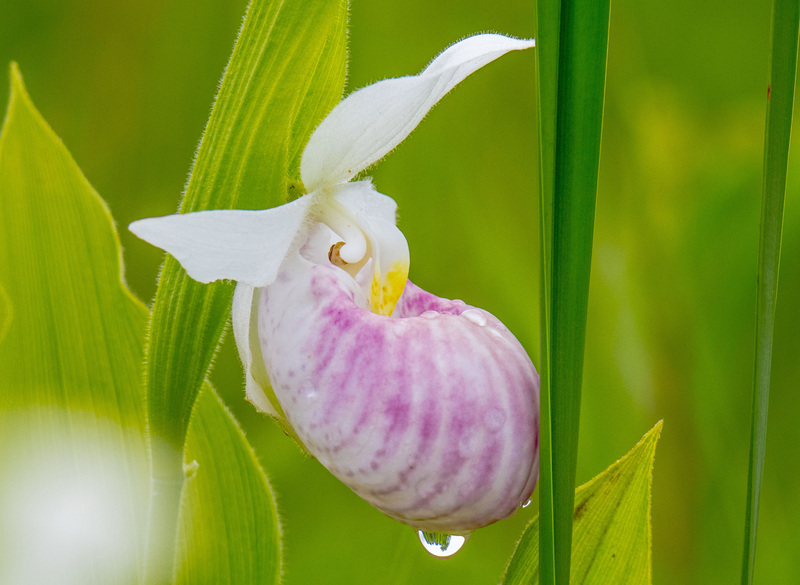 Since this trip home was a week later, and according to some with adequate knowledge of prairie forbs, it seemed as if this was about the time to capture images of the Minnesota State Flower, the Showy Ladyslipper. As I traversed across the state I had already made cell phone calls to the state parks in Bemidji and Itasca, and a woman at Itasca suggested I was at least a month early. Remembering the progression cycle of plants from my college days, I then placed a call to Maplewood State Park, which is another hour or so south of Itasca. Maybe the Showys’ were starting further south. They weren’t, said the park manager, who then added, “She’s right. I’d aim for the end of June. By the way, if you are looking for something closer than Itasca, the roadside on Highway 34 between Park Rapids and Detroit Lakes typically has some wonderful clusters. I would start there.” I told him about finding the Paintbrush. He wasn’t surprised. About two weeks later, Morris-area naturalist Dave Jungst posted a few pictures of the Showy he had discovered near the Johanna Lake Esker, a Nature Conservancy site adjacent to the Ordway Prairie in Polk County. This is on the edge of the Glacial Shield. Not knowing if there would be another opportunity to photograph the Showy, I took that route on the way to the Studio Hop in Willmar, where I was scheduled to set up for the weekend exhibit and sale. 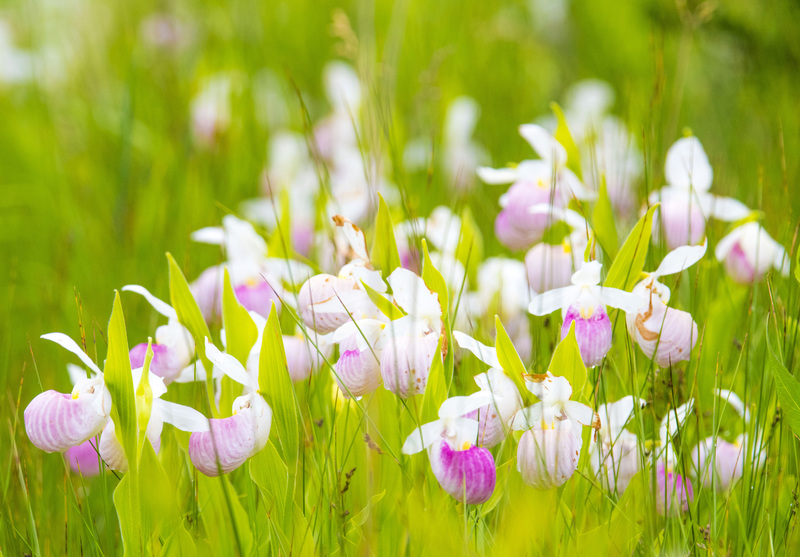 My desire was to complete a four-card set of Minnesota’s native orchids. Having never seen the Showys before, I imagined they would appear much like a few of the other native Minnesota orchids. Small and delicate, content in the comfort of surrounding prairie grasses. Instead the stalks stood tall and defiant, bursting from adjacent grasses with solid plant pride! The esker plants were sparse and scattered, and walking along the roadside they were easy to spot and photograph. Keeping an eye on the time, I jumped into the truck and popped over the hill where a couple of cars had pulled off the gravel road next to a nice clump of Showys. More pictures. So, yes, I had images. Yet, images that were more botany-like than artistic. With plans to meet a film crew for a segment on kayak fly fishing for bluegills for Prairie Sportsman at Glendalough State Park, I decided to bring my camera gear along should we be released from filming early enough to scout the park for Showys. Harsh, 20 mph winds and intermittent rain forced a cancellation of the filming, and since I had already planned the day off the farm, I left and headed north. My plans were to be at Itasca State Park early afternoon. At Fergus Falls I decided on a whim to skirt to the west and head toward Detroit Lakes and Highway 34, heeding the advice of the Maplewood park manager. Wise decision, for I had barely got onto Highway 34 before I found a cluster of about 200 or so Showys. They blanketed the shoulder in all directions. After wading across several feet of soggy mud and cattails to reach them, I made an effort to capture them in all their glory and beauty. This was just what I was looking for, and for about an hour I worked various angles to capture the essence of this beautiful native orchid. 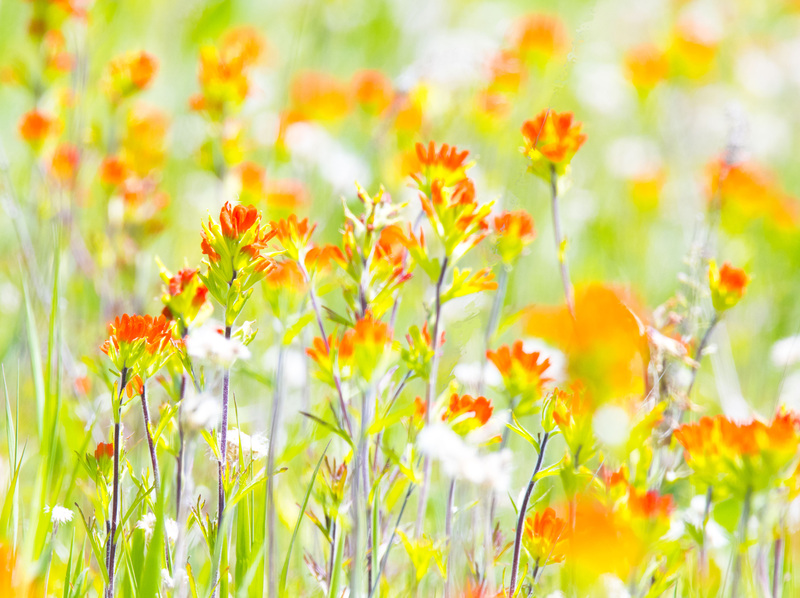 Later, as I drove away more species of native flowers graced the shoulders, along the same area as the paintbrush. I realized that the park manager was right, that Highway 34 is a treasure trove of native flowers throughout the summer. And, that this short stretch of road offers us some beautiful roadside attractions. You may like the work of Canadian Freeman Patterson.